Announced as part of DC Comics's (seemingly short-lived) "DC You" initiative some months ago, Bizarro and Prez have in common two limited series that each buck the traditional reins of the DC Universe for stories that are parodic and, in Prez's case, set outside the DCU entirely. Bizarro, at least, uses DC Universe characters; Prez, despite it's DC origins, might have more properly been a Vertigo title, except perhaps for the recent push to keep established properties under DC and creator-owned series under Vertigo. Whatever the case, in the sense of "DC You," Prez Vol. 1: Corndog-in-Chief is the more effective of the two titles. While Bizarro is an interesting diversion, fun but not necessarily grounds for an ongoing, Prez is the kind of forward-thinking, risk-taking title DC ought be publishing (though something like Prez but actually set in the DC Universe would best begin to rival the output of some of DC's competition). Simplest but most telling is that writer Mark Russell can actually use names like Twitter and Tinder in the book instead of awkward approximations, which gives Prez an immediate maturity -- especially in telling a story that deals with the social media realm -- over more milquetoast attempts at "superhero stardom" as in Teen Titans. 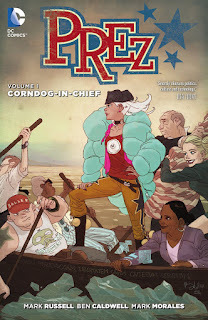 I enjoyed Prez and I would read more of it, but in some respects Prez doesn't get going until the end and it leaves the first half feeling half done (understanding that Prez is a twelve-part miniseries unexpectedly cut in two parts). This is mostly apparent in the plight of Tina, the "war beast" robot who escapes the army and goes to work for new teenage president Beth Ross. Tina does ultimately tie into Beth's story in the end, but the end comes so suddenly afterward that it seems a lot of set-up with no denouement. Equally, the end finds Beth scoring her first political victory, but it's said and done in just one page. Corndog-in-Chief sees Beth becoming president, but that's such a foregone conclusion as to lack enough suspense to carry the two issues it takes to happen. Further, while Russell has plenty of good political humor in Beth building her cabinet, negotiating with "Pharmaduke," and so on, I found myself hungry for real political conflict to sink my teeth into (where Prez, perhaps, needs to be less Bizarro and more Ex Machina or COWL). Beth's international "apology tour" and squeamishness over unmanned drones are wholly appropriate for the story, but seem the kind of obvious directions to take a teenage president; I'm more interested in the unexpected places Russell can move the story. Similarly that corrupt bigwigs get the rights to the world's DNA but Beth, in turn, patents the bigwigs DNA to gain leverage on them seemed a common kind of comic book twist; I have faith Prez can do better. But Prez is funny, no doubt about that, perhaps best in the dark recurring humor of "Carl, the End-of-Life Bear," representing our best fears about a caring healthcare system that doesn't care at all. Tina nearly steals the show from Beth as the robot -- with her comically too-straightforward speech -- seeks absolution for her war crimes in a church group in over their heads. There's more technological hijinks in a "meat generator" fondly dubbed "Tabitha," which -- even better for the joke -- actually factors into the plot later on. Another smart example of where Russell stretches the story's imagination is in the various apparatus that protect Beth, including a nuclear warhead phone app. Just as one of my biggest takeaways from Bizarro was Gustavo Duarte's art, Ben Caldwell certainly makes a splash in Prez. It ought go without saying, but that he can offer an expressive female protagonist, equal parts realistic and cartoony, without excess or sexual gratuity, is significant in my book. The same as Duarte, I'd be happy to see Caldwell on a Teen Titans book (even written by Russell) or some other title equally in need of art up to the standards of Image and the like. Surely I'd read more Prez (even beyond twelve issues, into Beth Ross's re-election campaign and beyond), and Prez Vol. 1: Corndog in Chief is a fine start. It's just a start, however, and my suggestion would be to wait until the second volume comes out, or the inevitable deluxe combined edition, before venturing in. I don't object to a good cliffhanger, but for Prez Vol. 1 it's more of a fade-out, and I don't think that accurately represents how good this book is and will be when taken all together. I loved Prez, and am glad it got the Collected Editions stamp of approval as well. But with Caldwell now apparently working at Marvel, I'd be very surprised if the series ever does continue. It sold terribly, and DC has kind of dramatically moved on from the whole experiment that made it possible at all to begin with. I can't agree with your statement to hold off buying this book until the second trade or possible deluxe edition. Single issue sales were not good, and I think readers should support this trade collection NOW so DC will have the incentive to keep going with it. I disagree that it's not a good enough story by itself to read. There's a lot of great political commentary here as well as a good story and great art. It deserves to be bought and read as much as any other trade out there that runs many volumes/issues. Good to hear. Long wait, but comics fans have certainly had longer.